Question first: Does heaven really exist? Answer: Yes, it does exist. In fact, it’s just in Ipoh! 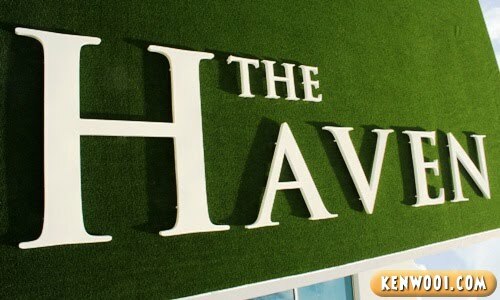 Ladies and gentlemen, I present you – The Haven! The good thing about this Haven is that you don’t have to pass away (die/mati/sei) to be there, and you won’t be seeing a bright passage that will lead you to the original Heaven. In this case, all you need is a car. A car that can bring you 10 to 15 minutes away from the Ipoh city center. Anyway, as I entered the vicinity, I saw the pathway to the doors of Haven! Just imagine the angels go “Ooohhhhhhhhhhhhhhhhhhhhhhhhh!” harmoniously. Hallelujah! I was excited. However, I was kinda surprised to see that its still an empty undeveloped land. I thought it’s supposed to be like this! Once again, angels go “Oooohhhhhhhhhhhh!”. Quite a beautiful place to stay once it’s completed right? Oh not, it’s just the foundation of one of the structures. And nothing near to the illustration from the heavenly brochure. 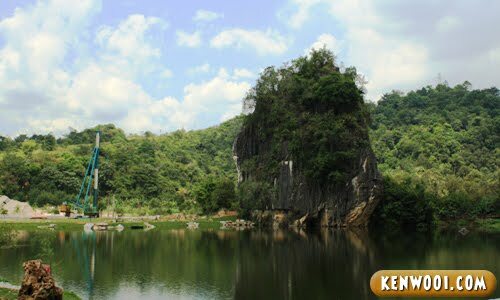 And yeah, the beautiful features of this Haven are probably the uncontaminated lake and the gigantic limestone shaped like a diamond. Well, almost like a diamond lah. Anyway, they call it “Your heavenly hideout in the heart of Ipoh”. Yeah, the original Heaven is pretty much a hideout as well – not many people know where exactly it is located. But it’s believed that Haven will be ready in 3 years. Therefore, not everyone is allowed to stay the unfinished Haven yet. God has ordered that any dead trespassers will be shot dead again by His loyal protectors. Even the gate to Haven is heavily protected by the trustworthy gatekeeper. Hmm.. Looks like the gatekeeper is always busy. whoaaaaaaaaaa looks like it’s gonna be so beautiful! wah now can bribe my way to heaven ah? 260,000 rupiah can or not ah? the place look so great to stay lei..but the price at ipoh nw..is not longer cheap le..same as KL i thk..
Nice place but for Ipoh, its too expensive larh..
Too ex dy lo…last time near Ipoh got a row of bungalows for sale. Only Rm100k each….cheaper compared to this la! All sold out in a week! that gonna b swimming pool or original lake? uh.. superb!! I didn’t know about this even I live in Ipoh, untill you blog it. You buying a house there? Ooooo!!!! *green with envy! Last time, we had a food outlet here – Pizza Haven – in the end, closed down! Got one KTV nightclub also – Heaven! Also closed! LOL!!! Don’t play2 with the name Heaven! People die first, then only can go to Heaven mah!!! I heard of this place but cannot recall where.. at first i tot it sounded like a memorial park.. haven ma.. so i tot the name is for the “bye-bye cases” one.. but now seeing the price, i guess “gone cases” or “live cases”, i also cannot afford too! so expensive!!!!!! in IPOH some more got market or not…= = ohhh maybe it is the weekend home for those rich KL brats like the hamptons to the new yorker something like tat lar…. Not enough money to buy a condo unit in the haven. I think i just camp outside. is it the effect frm your camera? Wow, the Ipoh property market has finally arrived! but if governments don’t invest and maintain it properly, it will be another big trouble…. Quite expensive eh! You bought one unit ah? Hey, can I use your photo the one “Trespasser will be prosecuted” one in my blog? I promise your watermark will not be removed and I will credit you on the blogpost. Can or not? Can lah…. i remembered ur entry on postcards, and i know this is a long shot, but how much shold i spend on stamps if i want to send postcards to, say, Rusia & Brazil? heaven is quite expensive… I can only afford the purgatory at the moment. lol! Very nice post indeed. And a very expensive heaven haven. hahaha! My haven will be one of those quaint little kampung houses. Hmmm. Wow. I LIKE that last picture! Haha!!! 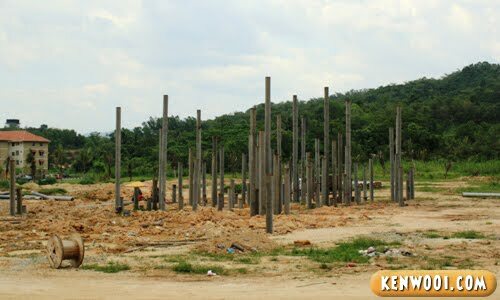 I thought it was under construction during my previous trip to Ipoh. And the banner says like “proud of the nation” or something like that right..omg..Who knows, it’s just a piece of empty land..
Lol! Doesn’t look very heaven now. and in reply to you comment on my blog, the hotels are known for their association with the red light district. That’s reallyyyyyyy a “Haven” ROFL. Very nice! That will definitely make it to my travel blog – in three years’ time from now, that is. 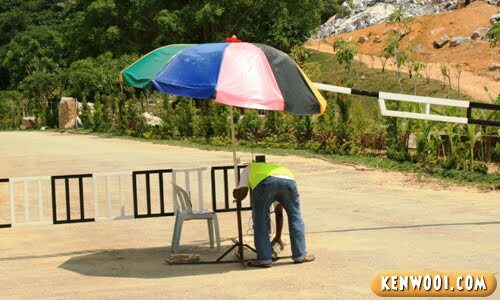 Are you from Ipoh, Ken? Years ago there’s a heaven discotheque at sunway. yesterday i really saw this ad billboard on the way to Ipoh LOL. The Haven luxury condo looks great! It sounds an excellent place for retirement life! Where to find similar concept development at KL???? 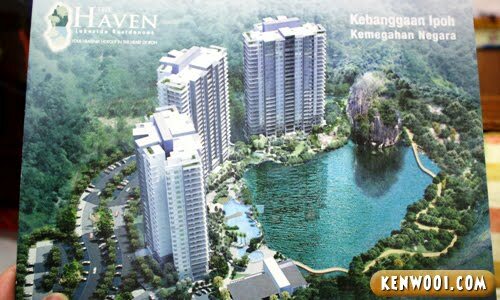 grrr.. wish my career is based on Ipoh.. then can buy one..
Construction has begun at the Haven, is not Heaven, please note the spelling :). Anyway most of the units are now sold out, people in Ipoh got money loh.